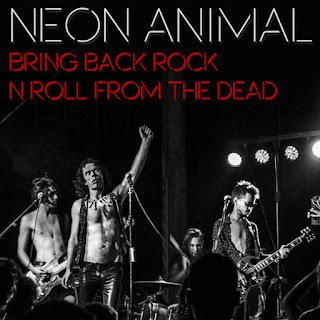 Saturday Singles: Neon Animal-"Bring Back Rock 'n' Roll From The Dead [Digital Single]"
Neon Animals is a UK band that is comprised of lead singer Mark Thorn, guitarist/backing vocalist Miguel Martins, bassist/backing vocalist Jonathan Gaglione, and drummer Iv K. Lizz. Just in case the singles' title isn't clear enough, Neon Animals wants to "Bring Back Rock 'n' Roll From The Dead". That's also the name of their upcoming debut album. As can be seen here, Neon Animals offers up an album version of the track and the radio edit. Neither one sticks out particularly. As for how this foursome is going to resurrect rock? Based on this so-so single, Hanoi Rocks and AC/DC seem to be the devil in the details (as it were) with nods of appreciation tossed towards the (old) L.A. hard rock scene and even (the) Dead Boys (attitude being everything as the old saying goes). On paper that all sounds like a grand day out. But on tape? Well, that's the big question of the day. Does this point towards the overall direction of the album or is this a case where the wrong single shows up for press day? While I'm inclined to think the former, history has shown me strange cases where the later rings true. So, even if this isn't my cup of tea, "Bring Back Rock 'n' Roll From The Dead" does find me hoping for bigger and better things to come from these four London musicians...especially seeing as their hearts are in the right place.